~ by admin on Jul 13, 2008. The graduate is a hunk with a fair balance of sports and academic achievements. 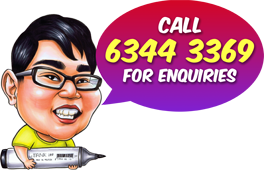 We drew him in his robe bearing the colours of National University of Singapore (NUS) Engineering faculty. He had books in one hand and dumbell in the other. 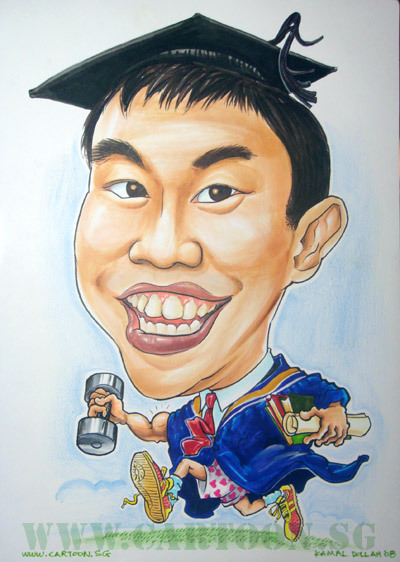 Since this caricature is a graduation present commissioned by his girlfriend, we showed his romantic achievements as well with the heart patterned polka dot boxer shorts. Mary Poppins and Wizard of Oz Librarians.